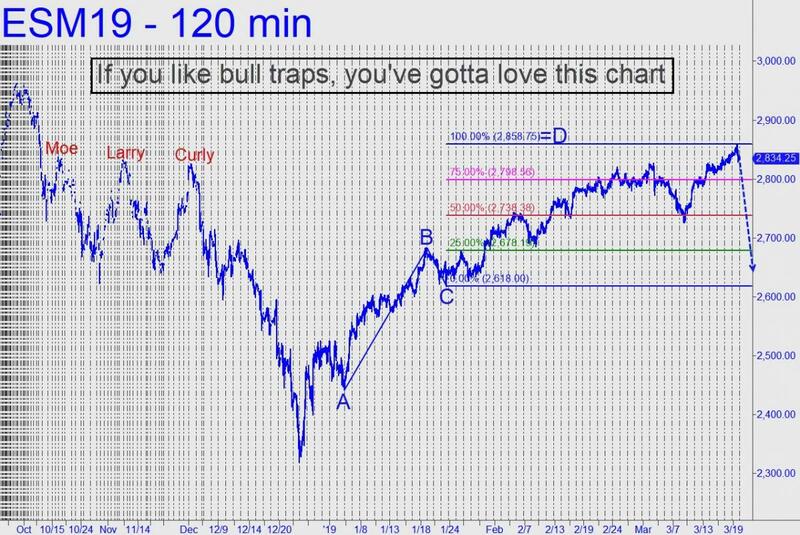 If you’ve been waiting for Mr. Market to spring the Mother of All Bull Traps, check out today’s chart. What a beauty this picture will be if Monday’s sharp reversal turns out to be the start of The Big One. Granted, odds of getting the timing of so important a peak exactly right will always be against technical swamis. But the chart has enough going for it that permabears could be forgiven for thinking they might finally be right. Add in the fact that the Fed on Wednesday is expected to mumble something dovish, and you have a perfect storm of bullish deceptions. If you’re a contrarian and a pessimist, the set-up looks irresistible. However, a very important caveat must be added: If the futures blow past the 2858.75 target in just a few days after having taken ten weeks to reach it, bears had better dive for cover, since that would be signaling more upside to at least 3,000 for the S&Ps and a further thousand-point rally in the Dow.